July is going to be a good month for tiny laptop enthusiasts. The Eee PC 901 and MSI Wind are either already available or will be soon depending on what part of the globe you live in. And the Acer Aspire One is starting to show its face at several online stores. Taiwan’s PCHome is taking preorders for the Aspire One, as is German store Geizhals. 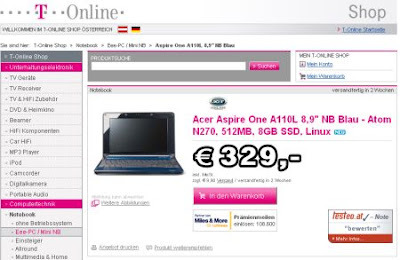 T-Online Germany says it already has the computer in stock for €329. Overlal, it looks like Acer Aspire One prices are in the €290 to €399 range, with the low end covering the A110L which packs an 8GB solid state disk and 512MB of RAM. For a bit more money you can grab the A150L or A150X with a 120GB hard drive, more RAM, and Linux or Windows XP.